So I recently upgraded my Comcast connection to 1Gbps down/35Mbps upload. I have swapped out the cable from modem to router with a new Cat6 cable - no luck. I have software rev 2.6.1, fully updated as of today (Feb 8, 2017). @landon-veitch Hi Landon! Can you generate support info from the router and send it to karlis.keiris@ubnt.com? Please include a link to this post as well. I have almost the same situation. I upgraded to AT&T Fiber and connected directly to the gateway, I get between 800-900 Mbps. Connected to the Amplifi router either wired or wireless, I get 100 Mbps. Can you shed some light on why? I turned on Hardware NAT based on another article but that didn't seem to help. @jason-etheridge Can you please do the same? Generate support files from the router and send them to karlis.keiris@ubnt.com and include the link to this post. I am having the same issue where my speedtest maxes out around 200Mbps up/down on Verizon FIOS Gigabit while I am running in bridge mode. I have proactively sent the support info and email as directed to the other posts, any ideas on why I am not seeing higher throughput? The Verizon test from my modem identifies gigabit speeds. @jason-etheridge AT&T Fibre here as well, getting full speed on throughput. After latest firmware upgrade. I don’t have a solution other than to say it does work over here, so it is possible. @landon-veitch @Jason-Etheridge @Stefan-Nobbe Screenshot of one of my servers doing a Speedtest hardwired into the router. 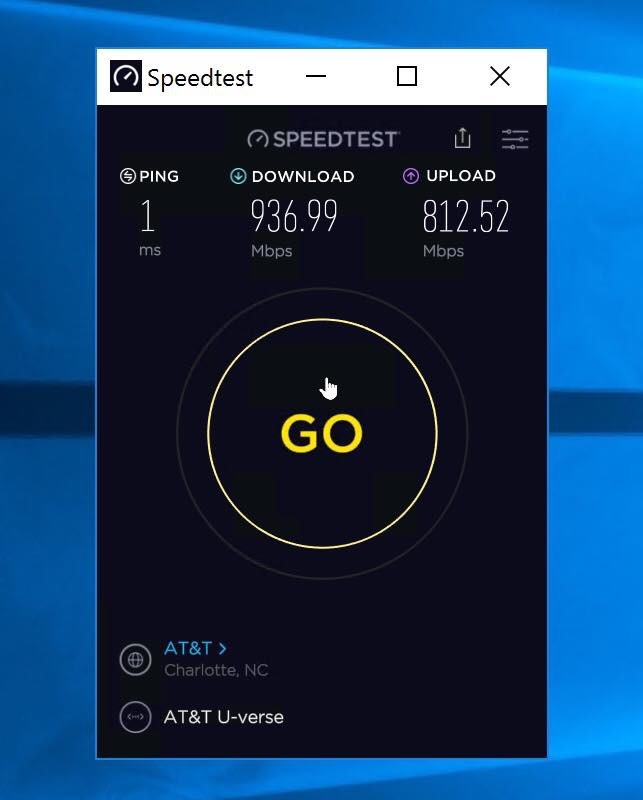 Make sure you’re using the desktop version of the app as the web version supposedly has some issues with Gigabit connections. You can download the desktop client from the Speedtest website. Would it help if I posted screenshots of my Amplifi router config as well? @jayson-knight I echo this statement. I use Wave 1G up/down and cannot achieve over 300 on wireless sitting 3 feet from the router. Out of curiosity, in the app if you go on the Family tab, under Client Details for the device, what does it show for MIMO (i.e. 2x2) and Rx Bitrate? @mark-chensky I seriously doubt you’re going to get over 300mb/s on wireless, even on ac, it’s just the nature of wireless. I am not at home right now and won’t be for a while, but I think I top out around the same speed. Perhaps the Amiplifi staff can weigh in on why this is true though. @jayson-knight 300 Mbps is definitely not a limit. I am routinely achieving 400 Mbps at home with single Amplifi router and Linux laptop behind thick brick wall. In lab environment, we usually observe ~460 Mbps download speed. I'm having similar issues. My internet is 600mb/s. I'm hard-wired to the Amplifi router but can't get anything greater than 100mb/s. I submitted my information. @landon-veitch Do you still have this problem? @eric-kavalauskas According to support info, your Internet port is working in 100 Mbps mode instead of 1 Gbps. For some reason, link mode autonegotiation has made such decision. Most probably your cable or modem port is faulty. Has anybody seen speed limited to 100 Mbps also with v2.4.3 firmware version (before more recent v2.6. * versions)? @landon-veitch This is not a new issue. Apparently they have been trying to address this for some time. I have been asking about this for the longest time as well. Similar situation. Not sure if they feel this is important. It is for me because I pay for the most speed and don't get it with this hardware. Can the team advise and provide information on this? Is this software related or simply the router just doesn't have hardware to support these speeds? @andres-betts Are you experiencing a 100 Mbps cap over a wired connection? The issue we're investigating here is WAN link not being negotiated to 1 Gbps. @jayson-knight I was told by the amplifi support "161mbps from the mesh points on 5ghz is normal speed"
@neil-chaplin That doesn’t sound right at all. I consistently get about 320’ish. It really sounds like the “theoretically possible” rates need to be published by the Amplifi engineering team, they should have these specs readily available. @ubnt-gunars I have experienced this although not this only. I have experienced nothing over 100Mbps in the AP antennas. The usual cap when using the main unit is around 450Mbps. All on this WIFI. When wired to the main unit I get the full 940Mbps that Xfinity offers. This is an old issue. I worked on this with a couple of techs at Amplifi to isolate the problem, but was told in the end that this is something that they were not putting effort into because it was not widespread. Can you please make an effort to at least arrive at an answer? If the unit is "not" meant to go over 450Mbps over wifi because of physical constraints, it is ok. I will wait for a next version of the product. If this is software related and fixable through coding, then I can help troubleshoot.